The year the music died? 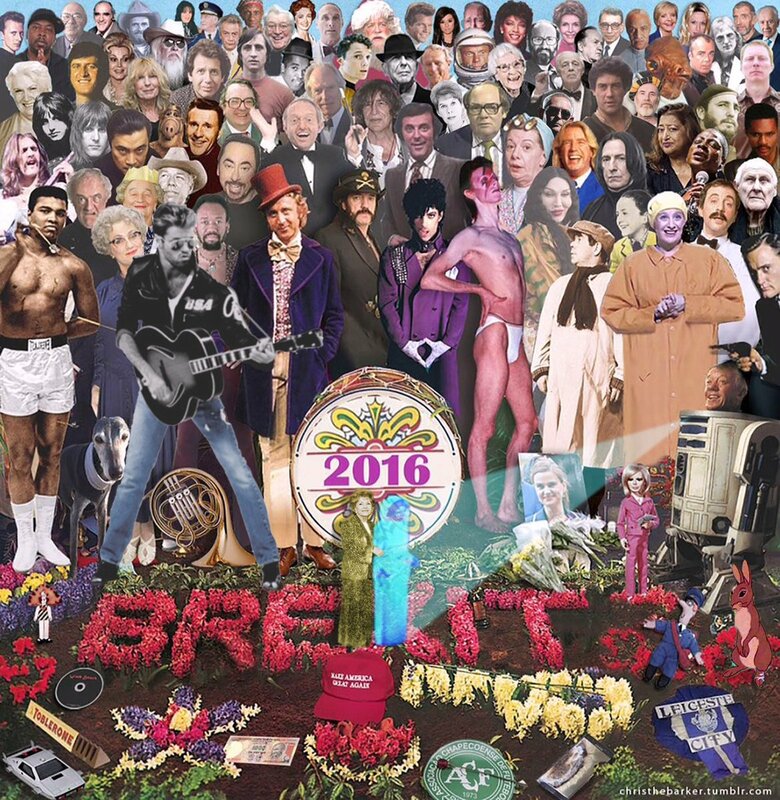 2016 will probably go down as one of those years where sad news overshadowed the good – certainly that was true for me both in personal terms, which I won’t cover here, but also the seemingly relentless march of famous icons being taken by the grim reaper. Just as we were coming to terms with Lemmy passing away at the end of 2015, in 2016 we’d be constantly reminded by social media of a glittering parade of cultural icons shuffling from this mortal coil. David Bowie, Alan Rickman, Glenn Frey, Jimmy Bain, Terry Wogan, Harper Lee, Frank Kelly, George Martin, Keith Emerson, Frank Sinatra Jr, Paul Daniels, Ronnie Corbett, David Gest, Victoria Wood, Lonnie Mack, Prince, John Berry, Nick Menza, Muhammad Ali, Henry McCullough, Anton Yelchin, Caroline Aherne, Kenny Baker, Dalian Atkinson, Gene Wilder, Pete Burns, Leonard Cohen, Andrew Sachs, Zsa Zsa Gabor, Rick Parfitt, George Michael, Liz Smith, Richard Adams, Carrie Fisher and Debbie Reynolds. That’s not an exhaustive list, I’m sure, but that’s not really what I wanted this blog post to be about – but you can’t really do a review of the year without mentioning the elephant in the room. As with seemingly most things these days it caused ruckuses on Facebook with folk taking to social media to express their sadness whilst others get irked at seeming over-emotionalness. Certainly there’s a lot in that list who whilst I’ve never met have had huge influences over my life, and I felt genuine sadness at them moving on – some seemingly far too early, others having reached a ripe of age. By a considerable margin I’ve not seen any live act as much as I’ve seen Levellers, Ferocious Dog and Gaz Brookfield – but I’ve never seen them all on the same bill, much less one after the other in the cozy confines of Rock City. It’s doubly fitting as if it weren’t for my enduring love of the headliners, I wouldn’t have discovered the other two (well, maybe I would eventually) – so Sunday’s trip to Rock City felt like a poignant and fitting way to close a circle of sorts. 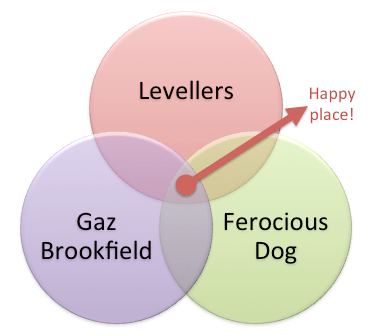 Being a geeky data mangler by profession I couldn’t resist a cheeky Venn Diagram! Unfortunately a season of festivalling and gallivanting off around Europe meant I didn’t have holiday from work to spare for the day after – coupled with a bit of mosh pit flu starting to kick in, driving to and from the gig seemed the way forward for Ella and I. That said, we were keen to get into Nottingham early enough to join the socialising in the Tap n’ Tumbler – immediately faced with Mark Chadwick surveying the swelling crowd of other familiar faces. 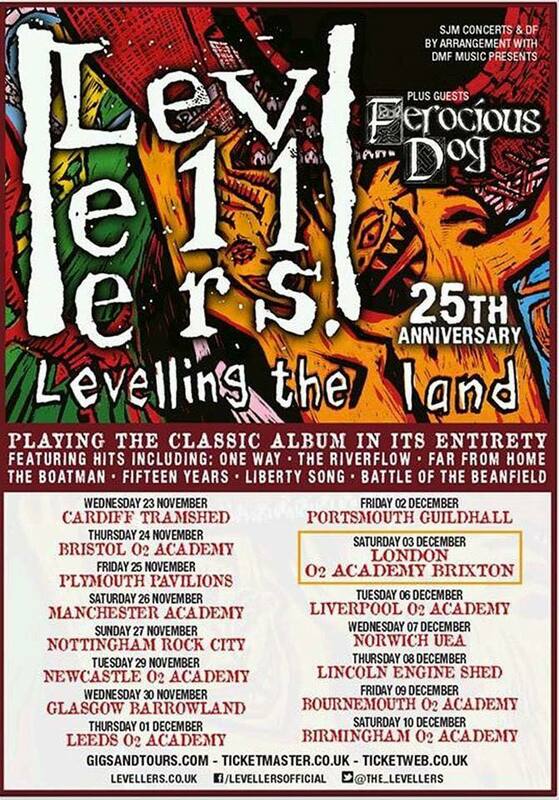 It’s funny, I still find it really difficult to go and chat with members of Levellers unlike the other two acts on the bill. No reflection on them, just me being a starstruck wuss! 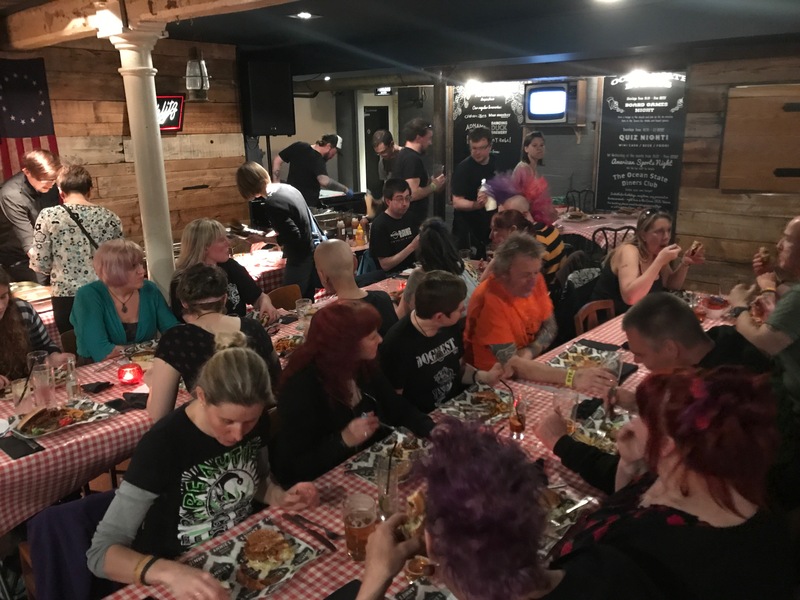 Elsewhere in the pub it became increasingly packed with countless gigging and festival friends – it was great to see Wez back amongst us in particular. 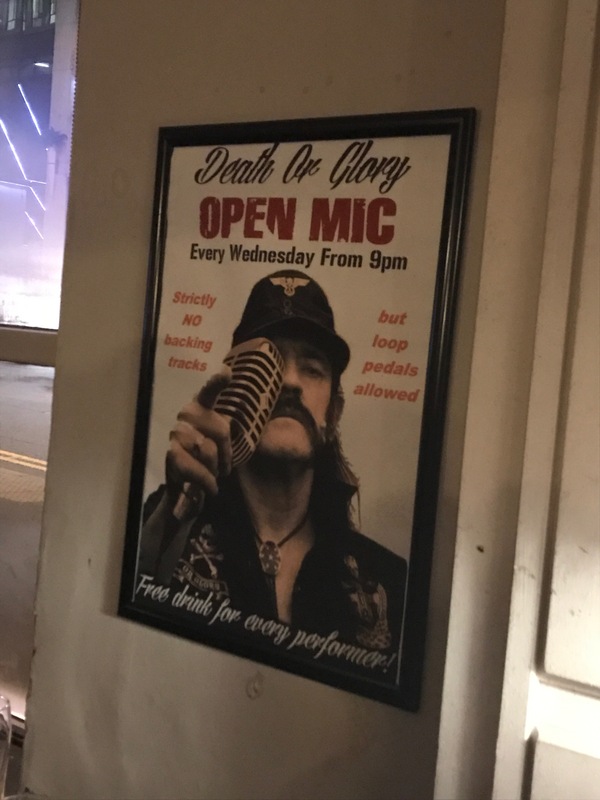 Being in non-drinking mode and mindful of an early start I’d planned on spending the gig further back and taking in the show – until Dean beckoned me over. “I need a word with you, Al” he said, looking a bit stern – after last year’s Rock City mix up he was insistent I needed to surf on him for Freeborn John to make amends – not that it was necessary, it’s a signal honour though. Looks like I’m in the mosh pit then! They did the mash.. it was the Münster mash! We set off early for Münster, it was a pretty quiet bus all told, all the more reason to appreciate the Herculean efforts of Dean and Stu who got us from place to place whilst we either messed around or slept. 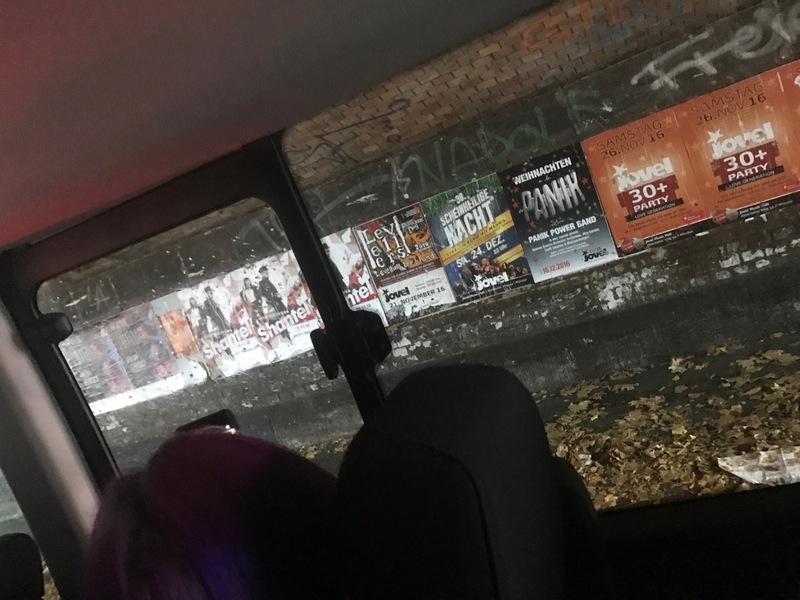 On arriving in town we spotted gig posters on the walls, and soon enough we were pulling into the car park of the hotel (hurrah! ), which was right next to the venue – Jovel (double hurrah!). They had a few rooms ready, so we were able to drop bags off and freshen up and await the rest whilst grabbing a quick drink from the hotel bar. Once everyone was ready we decided to risk public transport again and grab the bus into the town, this went much more smoothly than the tram in Amsterdam, and was really reasonably priced too – we’d got ourselves to the centre in no time at all and off the bus. Münster is a very scenic place – markets bedecked the streets and we had a nice wander around, having failed dismally in Duisburg to eat anything of note I was dead excited to get myself some currywurst, and very nice it was too before heading to a local pub to sink a few beers (and assorted local spirits). We went back via the market again, Mick bought a soap which he thought was a lump of cheese (ha! ), whilst Jacquie and I found some stagewear for The Star Copiers. The concensus on the bus was that we wanted to set off earlier than normal to allow for us to do a bit more sight-seeing in Amsterdam. A sensible idea, one I still hold by, but by gosh the excesses of the night before made it a challenge! I made it up for some breakfast, Mark wasn’t looking too clever, it was a quiet journey for most of us – much of it I spent asleep hunched in the corner of my back row seat! By the time we arrived in The Netherlands the storm that had apparently been ravaging England days before was sweeping over the lowlands. 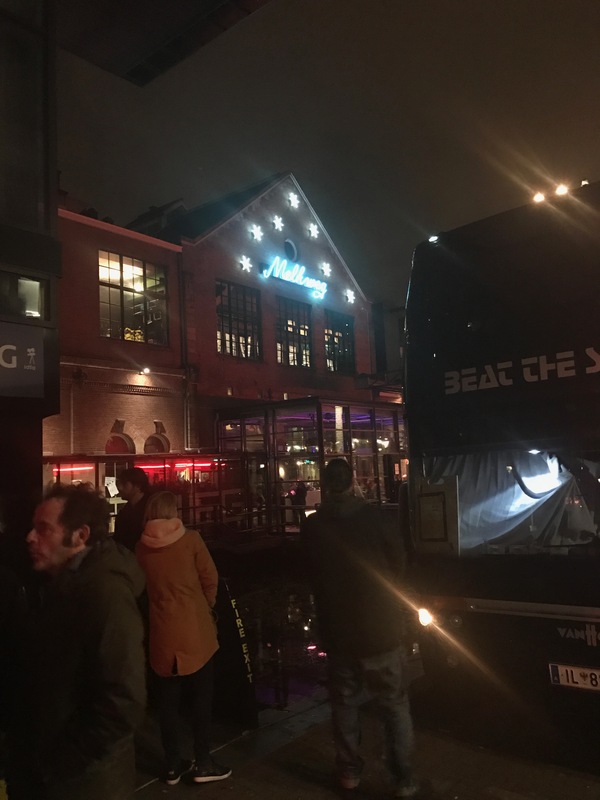 We headed into our destination watching leaves being blown in mini tornado patterns, mercifully the rain seemed to have subsided by the time we found our hotel – a short stagger from the venue, the iconic Melkweg, and right on the tram line to get into town. We’d booked parking at the hotel, but alas the bus proved a bit too big so poor Stu and Mark had to do a few laps of the city – which upon walking around it was bloody bedlam – before eventually changing on one right outside the door (and an epic piece of reverse parking to get in it). A bonus, as it meant we didn’t actually need to pay owt for parking in what is generally a pretty expensive place to leave a vehicle any length of time (unless it’s a bicycle or a moped which littered every pavement!). 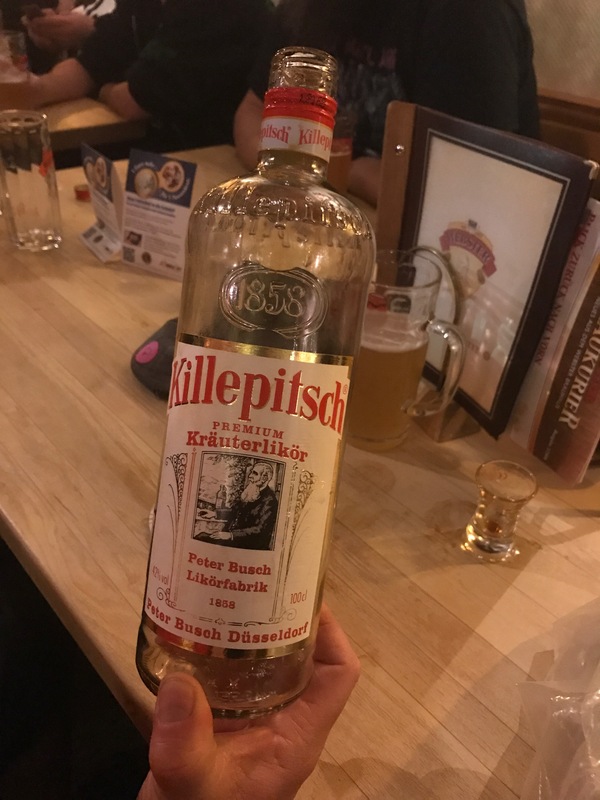 Dogging in Düisburg – sponsored by Killepitsch! Breakfast in Kortrijk was a little disappointing, but welcome nonetheless – and sustenance was pretty important. We didn’t have to leave too early so it was good to load up on caffeine and food before heading back onto the minibus for the next leg. 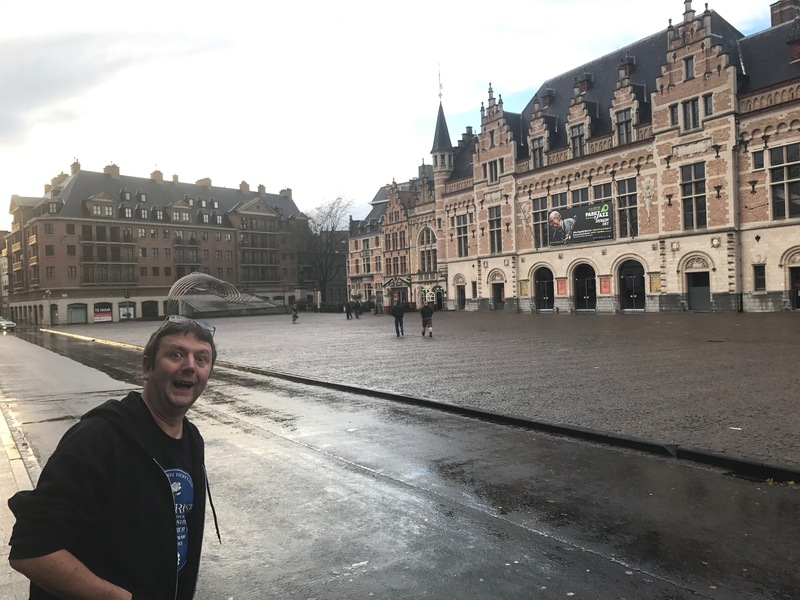 I think I pretty much slept the whole journey to Düisburg – a place I was only aware of because of League of Gentleman character Herr Lipp and semi-celebrity Nottingham Forest fan Ebby. Upon arriving outside our hotel we nearly ran over Addie and Jane! The hotel was bloody stunning, it was a shame we’d see so little of it really! I shared a room with Deano for this one, we got ourselves showered and sorted and wandered out into a bloody lovely city. 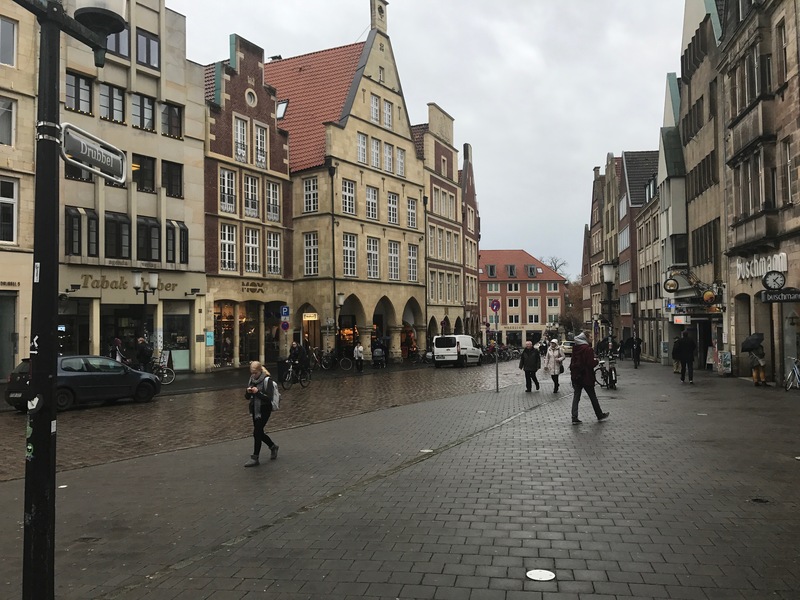 We headed straight to the German market (or, more accurately, since we were in Germany, ‘the market’) which was full of lovely smelling and looking things – keen to locate the venue we carried on walking and settled in the bar next door to the venue. Our British custom of standing at the bar doesn’t really work in Germany, there they conduct table service and mark your beer mat to keep track of your tab. Eventually we found a table we could occupy for a while and sank a few beers, and, oh dear, a litre bottle of Killepitsch between us – in the same vein as Jagermeister but a different regional variety. 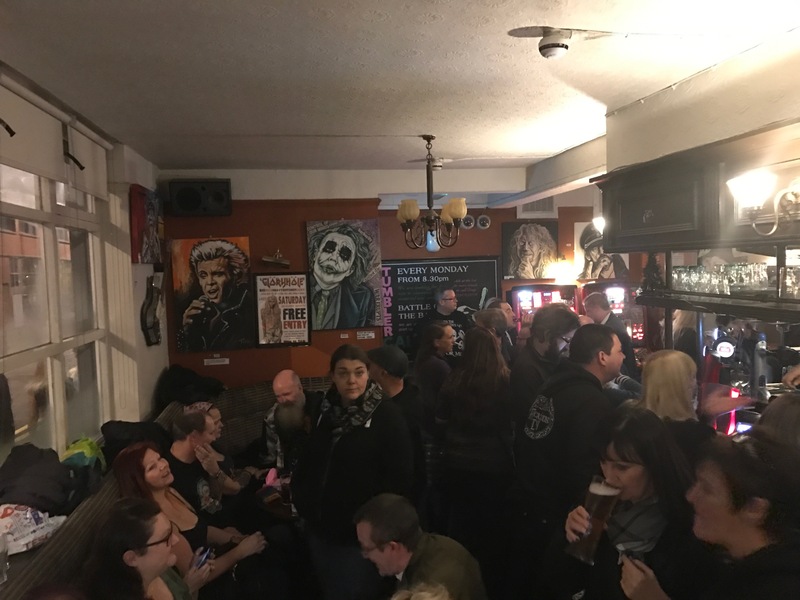 Plenty of familiar folk were descending on the place – not least Mark, Charlie and Mark from Levellers who were already propping the bar up when we walked in. Groovers on manoeuvres.. part one.. Belgium! I’ve been half dreading half looking forward to writing this, I’ve decided to split the four European dates into separate blog posts because I fear nobody would sit and read them all in one sitting! Last night on getting home and basically crashing it was daunting, but now the laundry’s on, the dinner’s been eaten and I’m ready to begin. I think. Our adventure started on Thursday evening, after work I popped home to finish up chores before heading up to Mark and Amanda’s to pick them up. From there we went to Kenny and Karen’s – ostensibly our plan was to get our heads down there for a bit before leaving at 3:30am to convene at Dean and Sarah’s to pick up the minibus. Our merry band of fifteen people had all been merrily making life as easy as possible for each other with car and roof sharing, although the bulk of the credit goes to Sarah, Dean and Stu who booked and organised everything – and in the case of the latter two, did all of the driving too. Of course, we never went to sleep – we wiled away the hours nattering, Mark and Kenny playing guitar, Kenny learning some last minute German phrases to say when he was on stage and watched daft videos. Ken left with the dog bus at 1am, we just carried on, Amanda tried to get some sleep, Karen did – soon enough it was time for us to go – five of us piled into my car (Trudi had rejoined us at this point) to head over to our next rendezvous. With the car parked up it wasn’t long before the minibus arrived courtesy of Stu and we piled on. I’ve been feeling a bit ropey all week – by the time I’d got in from work I regretfully couldn’t drag my arse out on Friday night for a The Leylines and Under A Banner which was a pisser. Yesterday was touch and go whether I opted to head up to Real Time Live to see Ferocious Dog and The Outlines, but having rested up in the day the relatively short drive up the M1 didn’t seem too daunting so I jumped in the car to hook up with some of the early revellers in the Barley Mow pub. First order of business was food, we left Kieron and Helen in the pub cheering on Norwich in their bid to beat Arsenal (which didn’t go too well, bad luck Kieron!) and eventually ended up in Einstein’s, a German themed bar / eaterie – the food there took a while to arrive, but bloody hell it was nice! I ordered a schweinshaxe (pork knuckle) – it was a thing of meaty beauty. The food Mick, Michael, Becky, Mark and Amanda had was similarly impressive. Next time I’m in Chesterfield I’ll be sure to eat there! Back to the pub it was, later than planned as the food took a while so it was a short stay before wandering over to the venue. 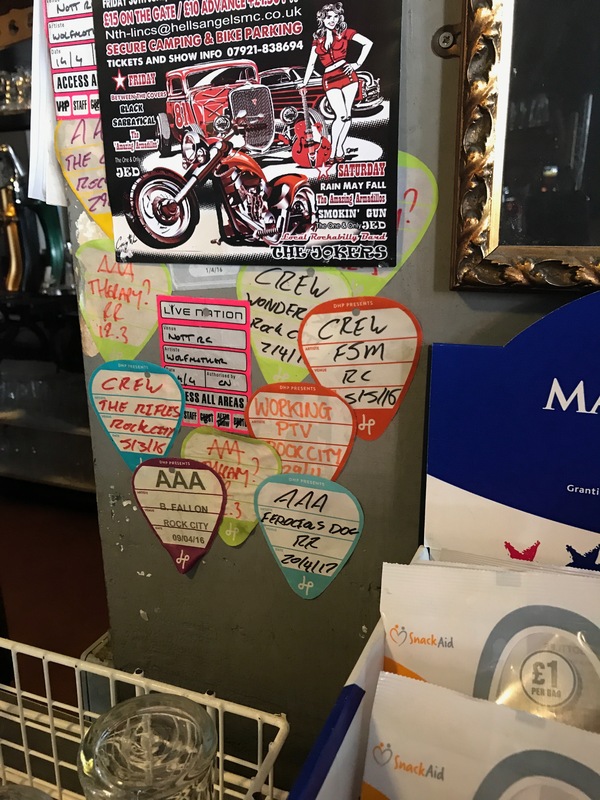 Real Time Live is a cracking venue sat above a music shop on a very domestic looking street – apparently it used to be a Conservative Club so it’s nice that such vestibules of corrupt ideology are being reappropriated for better purposes. 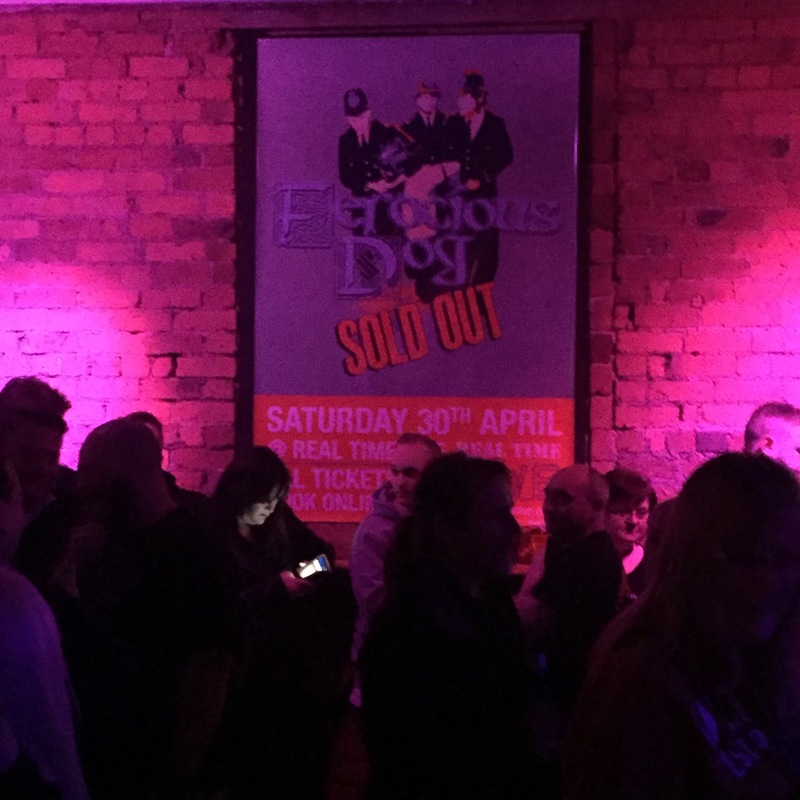 A big Ferocious Dog sold out poster adorned the wall along with other adverts for mostly cover bands. Derby heralds.. a NEW SETLIST! 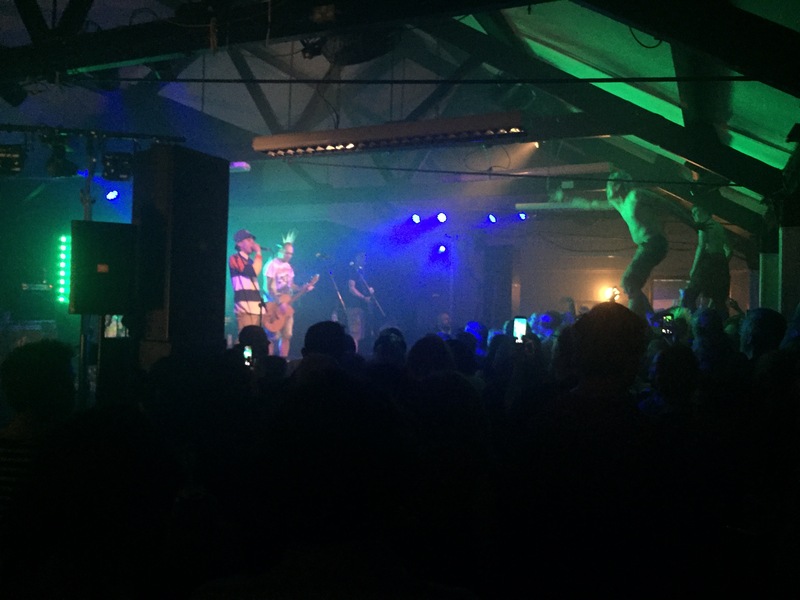 Unusual gig in Derby tonight, as I popped to see a friend embarking on a leaving do before heading on to the gig and feeling a bit lazy and sore of back I made a conscious decision to spend the gig out of the mosh pit. And whilst of course the lure is always there, I’m glad I did – it’s literally been years since I stood back and just watched the performance – it was a rewarding experience! Parked up near The Venue, it wasn’t long before folk started landing – we wandered to The Flowerpot for a quick drink, with Ella and Simon arriving at the car park not long after it was a short wander back, just in time for the doors opening. The Venue is a nice place, you enter into the bar area, up a couple of steps into an expansive flat performance area with a relatively small stage. The only quibble are the pillars which normally I wouldn’t notice but for my withdrawn position for a change. The support act, Seas of Mirth, entered the stage – all nine of them (it took a while for me to confirm this, and confusingly their Twitter bio reckons there’s eight of ’em!) – coming on with Belinda Carlisle’s Heaven is a Place on Earth playing – with ‘place on Earth’ replaced with ‘Seas of Mirth’ – an interesting start! 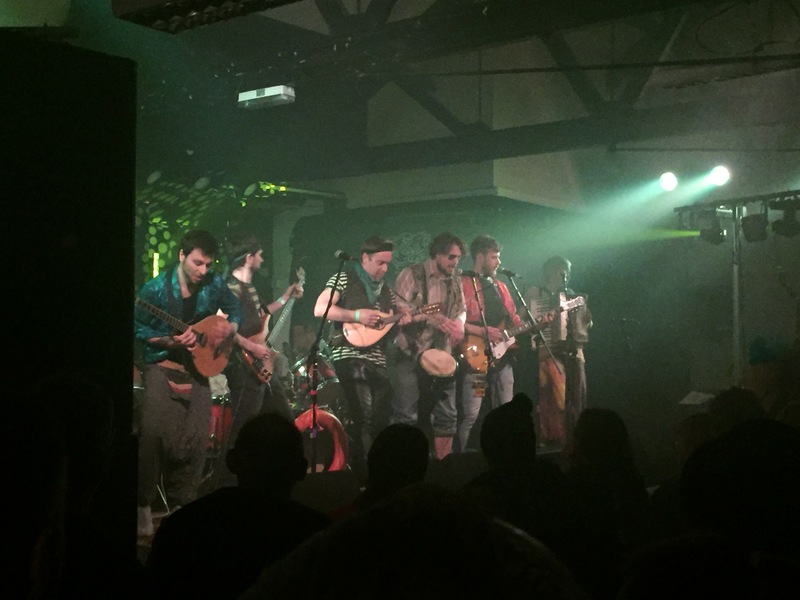 I know that Seas of Mirth played at Deerstock last year, whilst we were either tucking into – or sleeping off – a massive roast dinner from Nana’s Kitchen, but folk were raving about them so it was exciting to get the chance to see them for the first time. Edit: I’d meant to hit go on this on Friday morning to coincide with the ticket sales going live. Oops! Better late than never! If you’re a Facebook user you might just have noticed a small announcement earlier in the week. 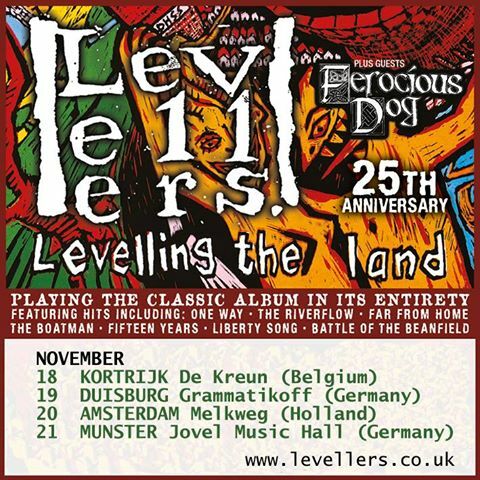 Ferocious Dog are only going on an autumn/winter tour with The Levellers. The. Bloody. Levellers. This is a full circle moment for me – I only found the band thanks to my love of The Levellers, and the thought of seeing them touring together has long felt like a pipe dream – now it’s reality. You can buy tickets for it right here. 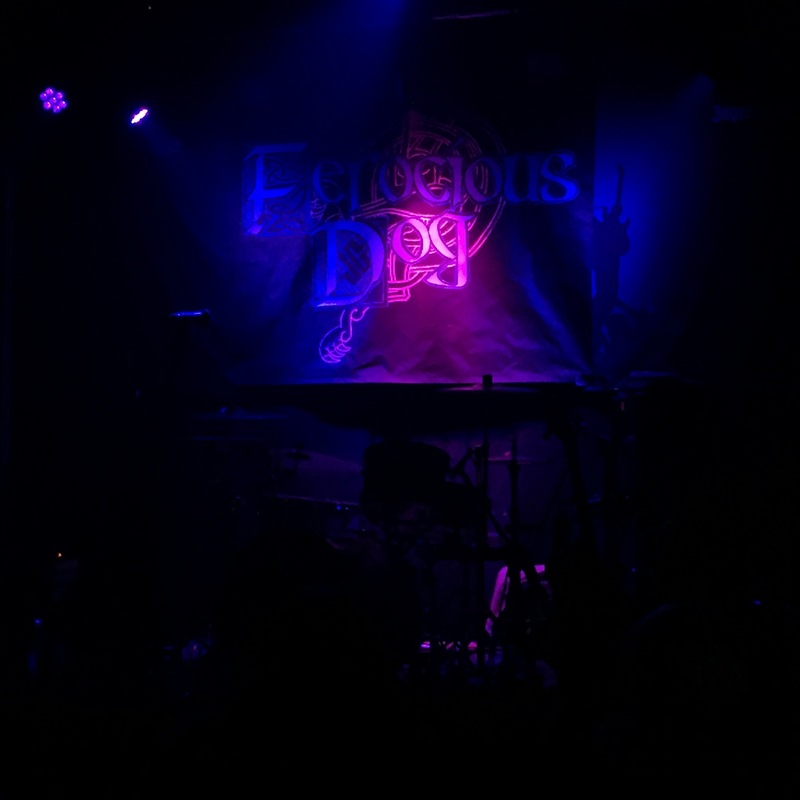 Thinking back to that first time I saw Ferocious Dog around five years ago – supporting Mark Chadwick – their set was cracking, it had me hooked, it was about 50% Levellers songs. That journey to transitioning from being a half-cover-band to one solidly founded on their own material has been an absolute privilege to witness. Of course there have been other landmark events from other notable bands – an aftershow slot for New Model Army, a support slot for the Wonder Stuff – both at Rock City, but a whole tour? It’s the stuff of dreams. On a personal note that is – my first musical love, and you supposedly never lose your first love, coupled with the band I’ve come to follow mercilessly around the place. It’s just not to be missed really, is it? Whilst going from selling out Rock City to playing second fiddle (huh, see what I did there?) to a bigger band might seem in some ways a step backward, it’s an amazing opportunity to get in front of a highly compatible audience that might not have kept abreast of how the band have developed.